ITC Welcomgroup's Chola-era inspired hotel in Chennai, the Grand Chola, has a 100,000-square-feet banquet hall ready for weddings and red-carpet events. 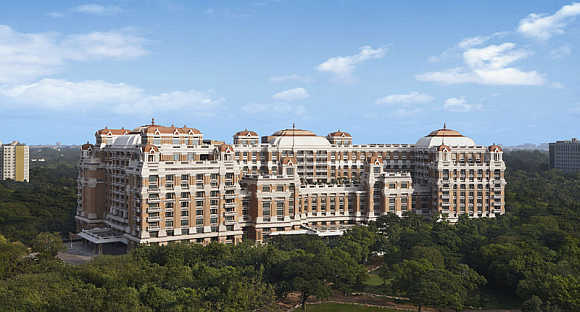 The recently opened Kempinski hotel in New Delhi has a ballroom large enough for 6,000 guests. Grand pavilions are also central to other new hotels like the Taj Vivanta in Gurgaon and the JW Marriott in Delhi's Aerocity. These hotels boast of many other attractions - rooms with large windows, adjustable lighting and spa treatment - but the banquet halls are the most noteworthy. It's not difficult to see why. In Delhi alone, about 5,000 five-star weddings take place in a year. Each wedding can result in a business of at least Rs 20 lakh - rooms, banquets and food. That makes it a market of Rs 1,000 crore (Rs 10 billion) in a year. Image: Grand Chola in Chennai. A large chunk of weddings takes place in the farmhouses on the outskirts of the city or in nearby cities like Jaipur and Agra. In a market that is getting more and more competitive, this is the newest gambit that hotels are using to survive. There was an increase of 15 per cent in the hotel room inventory in the country in 2011-12, taking the total supply to over 96,000. As a result, the occupancy level has remained almost static. Nationally, occupancy levels rose 1.9 per cent, while the average room rates increased 2.2 per cent. But in most large cities, including Delhi, Mumbai and Chennai, there has been a drop in occupancy by around 10 per cent and the average room rates have seen a decrease of around 5 per cent, according to industry experts. 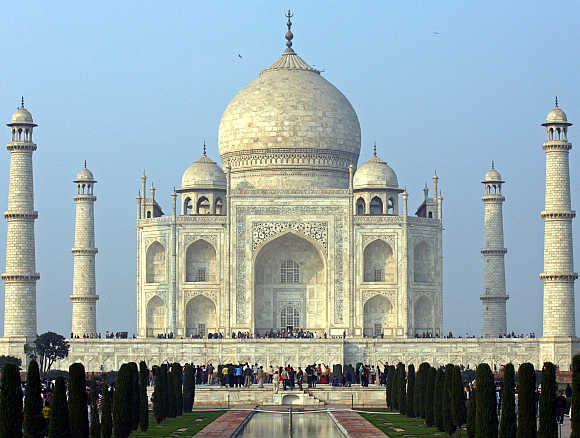 Image: Taj Mahal in Agra. Many weddings take place in cities like Agra. And the competition will become more intense in the days to come. By 2017-18, the total room supply in the country is expected to grow to 175,980. Nearly 36 per cent of these rooms are expected to be in the mid-budget segment and 18 per cent in the luxury segment. Delhi, which has a branded room inventory of 11,000, is set to see an addition of over 5,000 rooms after the Aerocity project is ready. The markets where inventory is expected to rise significantly are Bangalore, Chennai, Kolkata, Goa, among others. This would keep ARRs under check for some time till the supply balances out against demand. In the short run, industry experts say that the demand and supply gap in the sector could widen with more supply coming in the market. 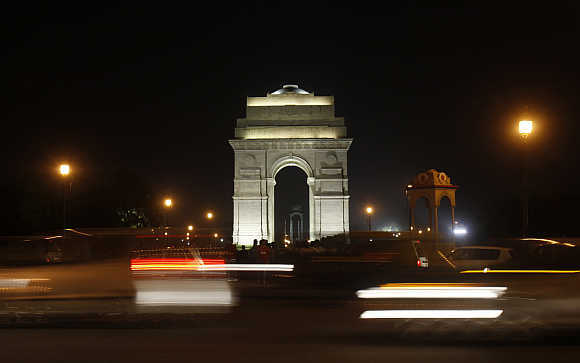 Image: Traffic moves in front of the India Gate in New Delhi. The city is set to see an addition of over 5,000 rooms. "It is a cyclical business. The supply will take a couple of years to absorb," says P R Srinivas, senior advisor, HTL Capital Advisors, a consultancy firm. That's worrisome for the hospitality sector, especially as traffic is slowing. In 2012, foreign tourist arrivals grew just 5 per cent. By comparison, 2011 saw a 13 per cent rise in tourist arrivals. Travel for work, too, has slowed with companies going on a cost-cutting mode. They are increasingly making do with tele- and video-conferencing, instead of face to face meetings. Some have even set up their own guest houses or taken studio apartments on rent. But, while business may be down, it has not stopped hospitality chains from opening up new hotels. 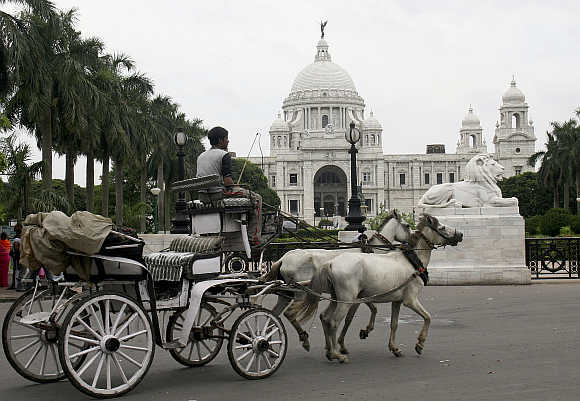 Image: A horse-cart passes in front of the Queen Victoria Memorial in Kolkata. The city is also expected to see big rise in inventory. Almost 60 per cent of the new hotels have opened up in the last five years - in the thick of the slowdown. The saving grace for new and old hotels alike has been the restaurants and banquet halls. Hotels are, therefore, rushing to tap this market. As a result, the share of banquets and food & beverage in the total revenue of hotels is steadily rising. From 33 per cent in 2007-08, it went up to 38 per cent in 2011-12. At the same time, the share of revenue from rooms has fallen from 61 per cent in 2007-08 to 55 per cent in 2011-12. 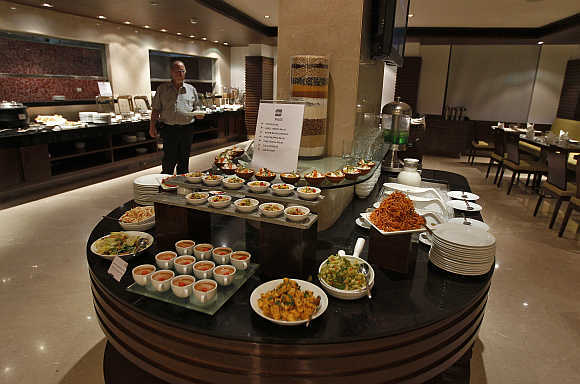 Image: A guest walks inside a restaurant of the Four Points hotel in Ahmedabad. "There is a dearth of good convention centres and banqueting space for both marriages and business events. In a local market such facilities stand out," says Srinivas. While the hotels are trying to exploit new revenue streams, they are also working to manage their costs. Sustainable technologies that lower power and water consumption are becoming popular. But controlling manpower costs isn't easy. Hotels are trimming their staff-to-room ratio to bring it closer to international standard. At 1.6 employees per room, the average ratio in India is nearly twice the international standards. 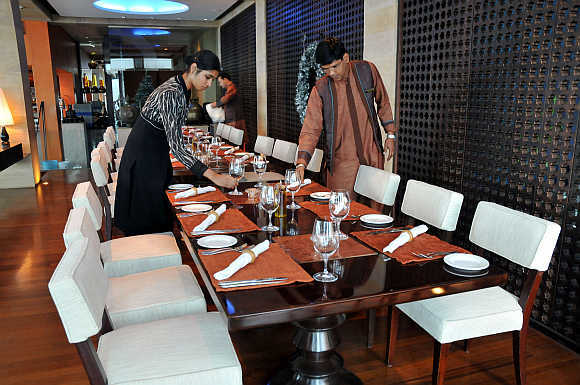 Image: Employees of Taj Mahal hotel prepare 'Souk' restaurant in Mumbai. "Currently we are seeing that the supply of manpower is far less than the demand, since so many hotels have come up in the last few years in the Indian market. "We are trying to make our employees more efficient by improved technologies without compromising the quality of services," says Jan Smits, chief executive officer (Asia, Middle East and Africa), Intercontinental Hotels Group. According to a survey by Federation of Hotels and Restaurants Association of India and consultancy firm HVS, the average percentage of trained employees per hotel is 83.3 per cent in 2012. 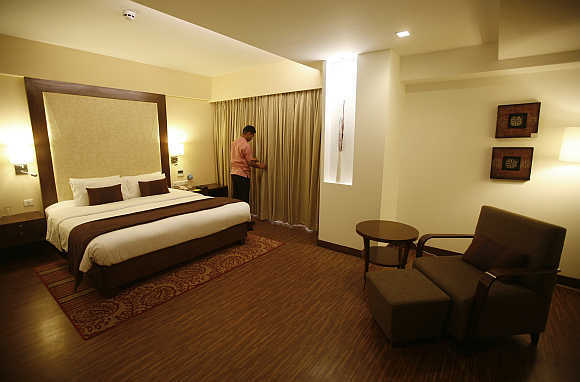 Image: An employee prepares a room for guests at the Four Points hotel in Ahmedabad. "With supply expected to increase by nearly 111 per cent in the next five years, the demand for high quality professionals will continue to increase and will also lead to a steady rise in compensation levels," the survey says. "For the first time revenues are falling and employee costs are increasing. The payroll costs have gone up from 12 per cent to 16 per cent in the last couple of years," says Ajay Bakaya, executive director, Sarovar Hotels and Resorts. "A number of things play out when you are in a tough market. Our brands are best positioned in their categories. We have a very strong focus on MICE (meetings, incentives, conferences, and exhibitions). We have continued our expansion in Kochi, Bangalore, Bhopal and also Aerocity in Delhi," says Rajeev Menon, Marriott's area vice-president (India, Pakistan, Sri Lanka and Maldives). 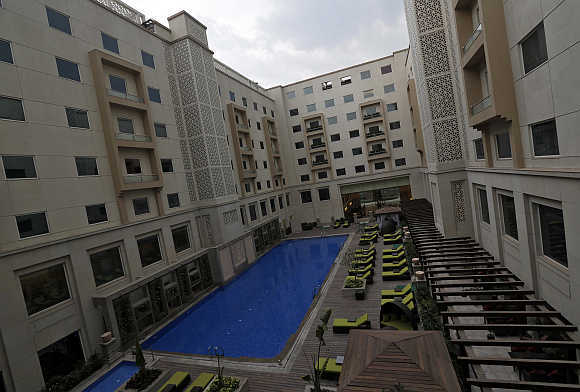 Image: A view of the Lemon Tree Premier hotel, located outside the Indira Gandhi International Airport, in New Delhi. The hotels in India were predominantly in the luxury sector, the additional supply has come largely in the mid-market space where the tariffs are lower. This has pulled down the average room rate of the industry. Is it a sign of correction in hotel prices? Experts argue room rates for luxury hotels in India at an average are still lower in comparison to some of the gateway cities of the world like New York, London where tariffs range around $600 a night. However, it is in the mid-market and budget segment that travellers find a paucity of rooms. The additional supply coming in these segments would spell good news for the consumer as it will rationalise the average room rate in the mid-budget segment. "We see a lot of scope in the mid- and -upper market which is highly underserved in India. We will be focusing on these segments through our brands like Country Inn and Park Inn by Radisson," says K B Kachru, executive vice-president (South Asia), Carlson Rezidor Hotel Group. 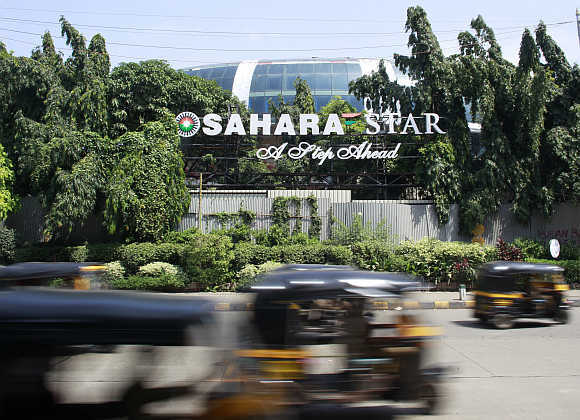 Image: A view of Sahara Star hotel in Mumbai.